Google has unleashed Maps 6.5 for Android, bringing with it easier navigation through the app and high resolution images for HD screens. Designed for Android 4.0 phones, the new update also allows users to swipe left and right to enter a new destination or jump to favourite destinations. The level of detail has been greatly increased to make it look all super snazzy and that on screens with a 'high pixel density', according to Google - with the likes of the Samsung Galaxy Nexus obviously in there. However, the Android developer has stated that the Samsung Galaxy S2 counts in this list, despite only having a WVGA (800x480) display. You want more detail on the new detail? Well, there are fewer labels dotted around to obstruct the road network or blocking out street names at higher zoom levels, and there's more of a colour contrast difference to make everything stand out that little bit better. Transit directions have also been given a slug of Google juice too, as you can now prioritise your favourite way of getting around the big cities, which is perfect for the bus-o-philes among us who hate having to make millions of transfers. 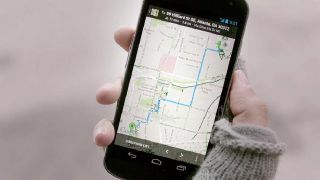 Google is maintaining this is a much more simple system to use when chugging about town – but just in case you have issues, there are TWELVE videos to check out on Big G's YouTube channel to teach you all about the nuances of Google Maps.